Order is restored at Melbourne Storm. After five rounds of Jekyll and Hyde performances the machine kicked into gear at AAMI Park, defeating Newcastle Knights 40-14, in front of a crowd of 12,386. Storm knew what had plagued the start of the season - ball control - but for whatever reason they failed to handle the Steeden in attack. That changed on Friday night as Storm exploded out of the blocks and returned to its clinical and conquering best against a resurgent Knights outfit loaded with talent. Storm had a point to prove after back-to-back losses equalled the club's worst start since 2004. The reigning premier needed just 90 seconds to strike through Josh Addo-Carr and then 10 minutes later partner-in-crime Suliasi Vunivalu added his name to the scorecard after getting on the end of a perfect Billy Slater kick into space. A fortuitous bounce created the try but Slater's ability to assess the situation and then execute should not go unnoticed. When Tim Glasby, who has been linked to a potential move to Newcastle next season, barged over for Melbourne's third try in 20 minutes it rendered the visitors desperate and breathless. Storm dominated possession and territory, completing the first 16 sets without fail. Storm coach Craig Bellamy praised the way the attack capitalised on the weight of possession. "We only scored one try in two weeks and all of a sudden we scored seven tries tonight and we completed at 80 per cent," Bellamy said. "Last four weeks we're been completing at 60-something per cent so you don't have to be a rocket scientist to work out what works." It was not without resistance, the Knights battled hard but sheer weight of numbers took a toll. They too completed sets on the odd occasion they actually handled the football. 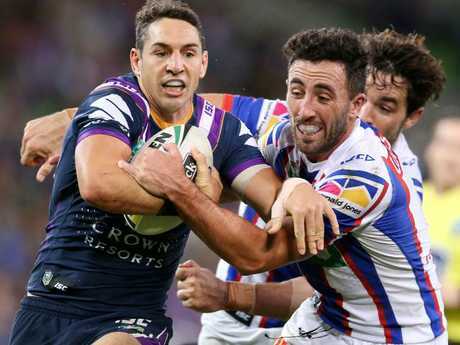 Knights' halfback Mitchell Pearce led a revival of sorts, laser passes to Lachlan Fitzgibbon and Ken Sio setting up tries to keep Storm honest. But a depleted Storm - missing Will Chambers (suspended) and Dale Finucane (thumb) - had the answer and contributors across the field. With Fitzgibbon binned after the restart Addo-Carr landed the knockout blow scoring his second try. 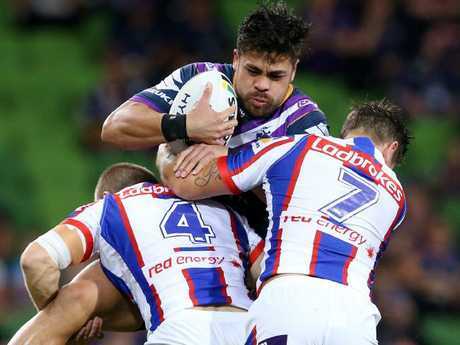 Despite the lopsided scoreline, Storm defended solidly, while forwards Nelson Asofa-Solomona and Jesse Bromwich capitalised on the weight of possession, combining for 297m from 29 runs. "I was a little bit disappointed in the first time they got down there they scored a try," Bellamy said. "The first half I wasn't feeling particularly comfortable with our defence inside our 20-30m area but the second I think we were a lot better than that." 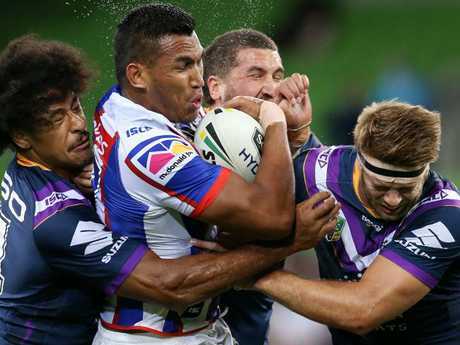 Storm captain Cameron Smith said lapses in goal line defence allowed the Knights to score a couple of "soft" tries. "I'm a little bit disappointed with some of the efforts in defence," Smith said. "We made some special efforts to hold the Knights ... but a couple of their tries were pretty soft tries I believe, they had to get the structure and execution right but I didn't think we did too much to stop them either. "That's certainly something that we need to address quite quickly, it's one part of our game that we have very high standards on is our defence, particularly on our goal line."